Enjoy a spooky stay this Halloween season at one of our favorite haunted hotels. From former prisons to medieval mansions to the property that inspired "The Shining," these terrifying retreats offer adventurous vacationers an up-close encounter with the spirit world. Enjoy a spooky stay this Halloween season at one of our favorite haunted hotels. From former prisons to medieval mansions to the property that inspired "The Shining," these terrifying retreats offer adventurous vacationers an up-close encounter with the spirit world. While some play down the paranormal connection, others take pride in their haunted history, offering ghost tours and sharing stories of ghastly guests -- including ancient Roman emperors, murdered French aristocrats and executed criminals. Make sure to pack a nightlight before taking off for one of these otherworldly accommodations. Staying overnight in a former jail is creepy enough without disembodied footsteps, a yard filled with unmarked graves and the ghost of a hanged inmate wandering the halls. Serving as a maximum security prison from 1862 to 1972, the old Carleton County Gaol was notorious for public executions and was the last official working gallows in Canada. The gallows remain, along with cells that Hostelling International has turned into guest rooms, complete with iron bars. Located downtown, this spooky property lightens the mood with their on-site Mugshots bar. If you still think the macabre factor is too much, take solace in the fact that dorm-style rooms mean you'll never have to spend the night in solitary confinement. Château de Brissac looks like an idyllic fairytale destination, with a handful of lavish bedrooms that gaze over a peaceful park setting. But the undercurrent is more poisoned apple than happily ever after. The castle dates back to the 11th century, and a few hundred years later it experienced an incident that anchors it among the most haunted properties in the world. Legends vary, but it's known for certain that the owner found his wife Charlotte with her young lover and brutally killed them both. He went mad and lost the castle, but Charlotte's ghost remains. She is known as The Green Lady for the gown she wears during her wanderings, and guests have encountered her often over the years -- moaning in the morning hours, revealing the eyeless face of a corpse and wailing as she tries to remove a sword from her chest. Emperor Nero is famed for playing the fiddle while ancient Rome burned. These days, he spends his time in equally spooky fashion: wandering restlessly from his tomb to the nearby Castello Della Castelluccia, seeking a peaceful place to sleep. Unfortunately, he's not alone. At this 10th century aristocrat's castle in the Lazio countryside outside Rome, he shares the local spirit world with an alchemist who was killed when struck by lightning in the tower in the 1600s. Guests have also seen apparitions of horses sold by one of the castle's noblemen to pay off a gambling debt. Sent to a foreign land, they soon died, and their ghosts returned to Italy, where they gallop across the grounds at night. 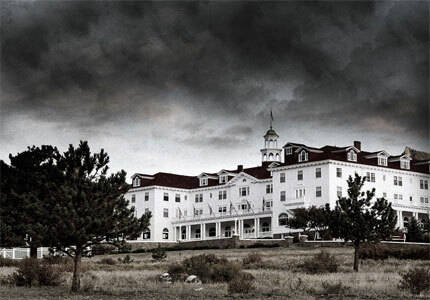 Jack Nicholson may have secured The Stanley in the annals of haunted hotels, but this lodging was the inspiration for Stephen King's classic, "The Shining," for good reason. It opened in 1909 and reported its first haunting in the 1950s: A chief housekeeper was critically injured in a mysterious explosion not long after the hotel opened. Since then, there have been rumors of children laughing in empty halls and the original owner's wife playing the piano in the middle of the night. The hotel capitalizes on its legacy, and some aspects like REDRUM mugs are cheesy, but nail-biting nightly tours and five-hour Ghosts Hunts are led by paranormal investigators. The scary thing about this hotel is how normal it seems. After all, how spine-tingling can a new-build Park Hyatt attached to a business center be? But this lodging was constructed atop a World War II prison camp and execution grounds. According to many hotel staff and guests, the spirits of those who were executed are not happy. The hotel doesn't capitalize on its gruesome past, but it doesn't ignore it either. Feng shui experts were called upon during the design phase, and numerous decorative details such as wind chimes and calligraphy scrolls are intended to ward off disconsolate spirits. The spirits, though, persist. They have been reported in the halls and rooms, and there is even a rumor that the brave action star Jackie Chan quickly checked out after encountering a ghost here.